Computing shale volume from several methods is a good idea and doesn't cost much when the computer software is set up for it. Trimming results between 0.0 and 1.0, and then selecting the "best" method is done based on sensible rules, or by taking the minimum of all reasonable answers. The material balance for shale content prevents impossible values and should be applied to each shale volume method used. If too many values fall below zero or above 1.0, the analyst should review the choice of clean and shale base lines. Less than 10% of all individual data points should fall outside the material balance constraints. Vsh from the density neutron crossplot will always be negative if gas crossover occurs. In this case, an alternate method should be used. Improper matrix offsets may also cause erroneous gas crossover. The usual approach for deciding which of the several available shale volume results to use is to find the minimum value of the feasible results. Feasible results do not include answers from the crossplot methods if gas crossover occurs. The minimum is chosen because most errors for any one method tend to increase the apparent shale volume. For example, radioactive sandstone would appear very shaly from the gamma ray but reasonable from the SP and density neutron crossplot. High resistivity zones subdue the SP, making it give to high a value for Vsh. Heavy minerals force the density neutron method to likewise give too high a value for Vsh. 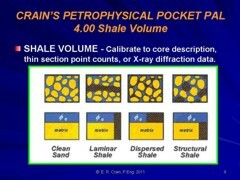 This algorithm needs to be modified to include the methods actually used to calculate shale volume..
1. Vsh from GR (if sandstone or carbonate is not radioactive). 2. Vsh from density neutron (only if hole condition is good, there is no gas crossover, and no heavy minerals). 3. Vsh from SP (only if SP has sufficient character or resolution to be believed). 4. Vsh from sonic density crossplot (not the Q method). 5. Vsh from minimum of above if there is no reason to prefer one method over another. 6. Use linear methods unless local correlations have shown a need for a non-linear relationship. Answers should be rounded to the nearest 5% (0.05 fractional) for hand calculations, and to the nearest percent (0.01 fractional) for computer work. Set negative values to zero and those greater than 1.0 equal to 1.0. Too much precision in an imprecise number is unnecessary and confusing. Computer generated plots of the results for the mixed lithology example are displayed below. The crossplot shale values are not valid because heavy minerals affect the results.